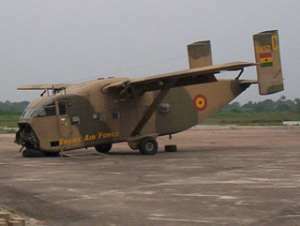 Accra, June 9, GNA - A seven-member committee appointed to investigate circumstances leading to the sale by auction of aircraft belonging to the Ghana Armed Forces (GAF) has submitted its report to the Ministry of Defence and noted that the aircraft and equipment were grossly under valued. The report, therefore, recommended that those involved in the under-valuation be dealt with under the GAF regulations. Dr Kwame Addo-Kufuor, Minister of Defence, who received the Report, said it would be submitted to the Office of the Attorney - General for necessary action to be taken on the recommendations by the Committee. A statement issued in Accra and signed by Mr F.O. Mpare, Chief Director of the Ministry of Defence, said that it was established that the Sector Minister was not involved in the transactions leading to the sale of the aircraft and other equipment to Pink Aviation Services. It said: "This was in line with the well established Ghana Armed Forces practice of leaving such matters in the hands of the Chief of Defence Staff." The establishment of the Committee followed the decision by the Minister of Defence to stop the ferrying of the auctioned aircraft outside the country when he became aware of the auction. The statement said Pink Aviation Services irregularly and illegally obtained classified GAF document, which apart from being illegal gave them unfair advantage over other bidders. According to the Report this document gave an erroneous impression to Pink Aviation that they had bought serviceable engines, spare parts and special-to- type of ground equipment whereas the then Aviation Board was simply to dispose of aircraft frames and unserviceable parts together with the airframes. The Report noted that another unfair advantage by Pink Aviation was the postponement of the closing date for submission of bids twice to enable the Company to submit its bid within time. The Report stated that the wrong impressions were one of the reasons for invalidating the purported contract. The Minister gave assurances that subsequent action which would be found necessary to defend the national interest and to protect its assets would be taken.